1. “The Changing Hydro-political Dynamics in the Nile Basin: Causes and Implications”, DISCOURSE, 2017. 2. “Water infrastructure and food security linkages in three selected regions of Ethiopia”, Eastern Africa Social Science Research Review (EASSRR), Vol. XXVIII, No. 1, 2011, pp. 27- 58, 2012. 3. “Aspects of Climate Change, Adaptation Strategies and Information Sharing in the Nile Basin”. 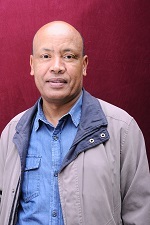 In Mulugeta Gebrehiwot and Jean-Bosco Butera (eds. ), Climate Change and Pastoralism: Traditional Coping Mechanisms and Conflict in the Horn of Africa. Addis Ababa: Eclipse, pp. 251-267 (ISBN: 978 9977 925 769), 2012. 4. “Land and water institutions in the Blue Nile Basin: Setups and gaps for improved land and water management”, Review of Policy Research, Vol. 28, No. 2, pp. 149-170, 2011 (with Fitsum Hagos et al). 5. ““Water Conflict Resolution and Institution-building in the Nile Basin”. In Roba Sharamo and Berouk Mesfin (eds. ), Regional Security in the Post-Cold War Horn of Africa. Pretoria: Institute of Security Studies (ISS), Monograph 178, pp. 257-279 (ISBN 978-1-920422-40-4), 2011.